Celebration Bears are handmade by Hospice of the Red River Valley volunteers. 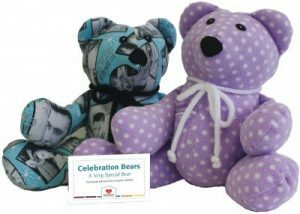 These special bears are made from your loved one’s clothing so you may have a keepsake to celebrate their memory. Families whose loved one was served by Hospice of the Red River Valley may request bears up to 13 months after the death of their loved one. Please complete the order form, and we will be in touch with you soon. There is a limit of two (2) bears per patient. Please supply approximately ½ yard of usable fabric per bear. Recommended fabrics include corduroy, fleece, flannel, sweatshirts, terry cloth and 100% cotton. We do not recommend silk, thick robes, lace, denim or clothing with holes. All remaining fabric and other items will be discarded unless you indicate otherwise. Do not submit anything you are not willing to have discarded, including buttons, patches or embellishments. You are responsible for dropping off fabric and for picking the bears up when they are completed. Celebration Bears are handmade by our volunteers. Imperfections should be expected. Celebration Bears should not be placed in a crib with small children. Allow small children to play with the bear only under adult supervision.